The GG Archives has a small collection of the very rare Allan Line Royal Mail Steamers, Established in 1852, later purchased by the Canadian Pacific in 1917. 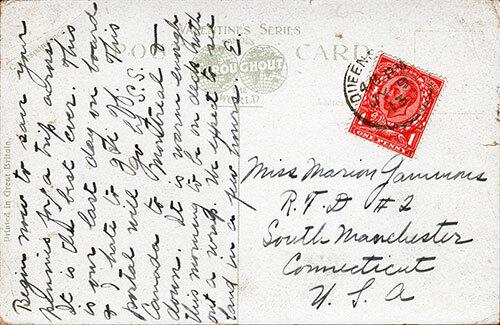 Our series of postally used and unused postcards date from the early 1900s. 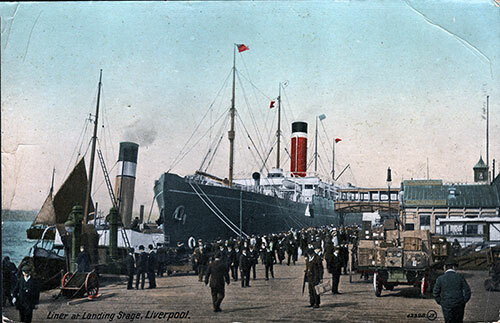 Postally Used in 1913, the scene captures a typical departure of a passenger steamship, showing passengers, visitors, and cargo on the landing stage. The back side appears below. 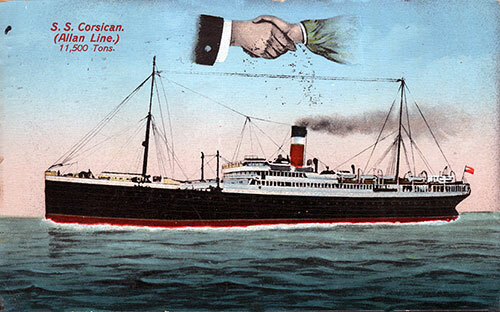 The Famous "Hands Across the Sea" Postcard Series incorporating the Ocean Liner Corsican in a painting of her at sea. 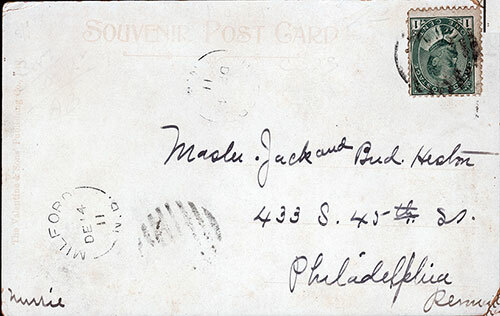 Postally Used in 1913. The back side appears below. 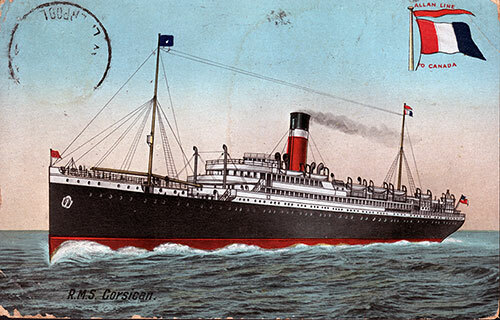 The Allan Line to Canada Postcard featuring the RMS Corsican at sea. 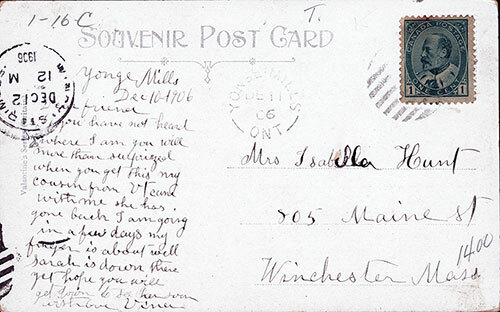 The postcard was posted at sea, most likely from an eastbound voyage in July 1911. The back side appears below. Postally unused postcard, published by C. W. Hunt & Co., Liverpool. 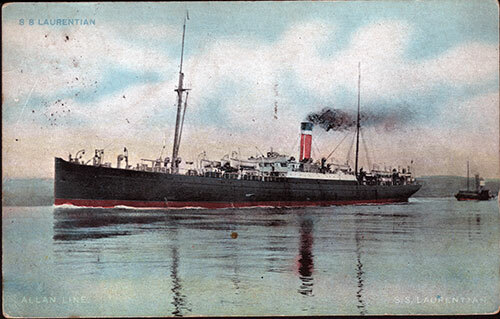 The RMS Grampian was 10,900 tons, 60 feet wide (Breadth), and 485 feet in length. The image shows the ship at sea at cruising speed. The back side appears below. 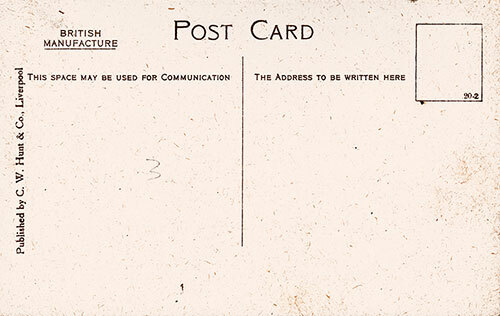 The postally used postcard canceled in Greenock on 24 October 1906, was published by The Art Publishing Company Glasgow. The scene depicts the S.S. Laurentian leaving the harbor, the tug boat guiding her out shown in the distance. The back side appears below. The famous Hands Across the Sea features the S.S. Pretorian in a most vibrant colorful painting of her in the open seas. 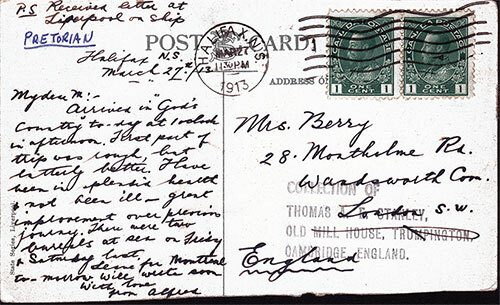 Postally used in Halifax, NS on 27 March 1913, the postcard was formerly part of the Thomas A. E. Stanley Collection. 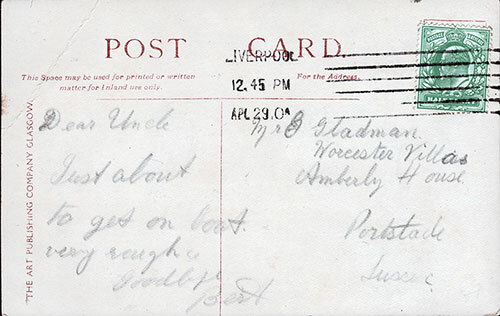 In the back side below, the sender mentions receiving a letter at Liverpool on the ship. 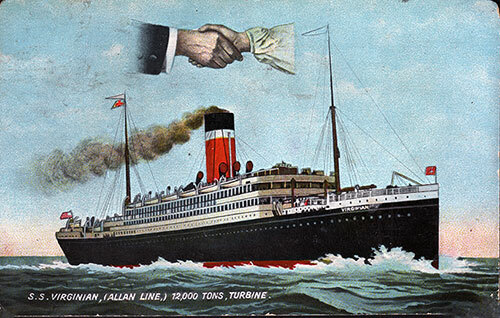 Unique postcard of the S.S. Tunisian of the Allan Line, leaving Montreal for Liverpool. The scene of the ship on the St. Lawrence River is magnificent. 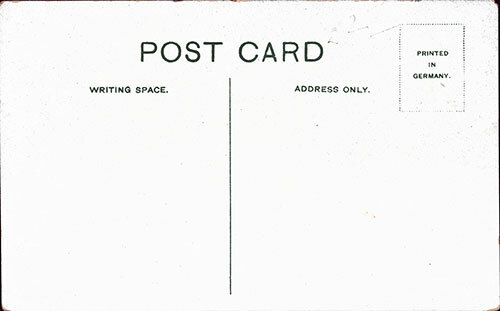 Postally used on 11 December 1911 in Yonge Mills, Ontario, it lives up to its moniker of "Souvenir Post Card." The back side appears below. 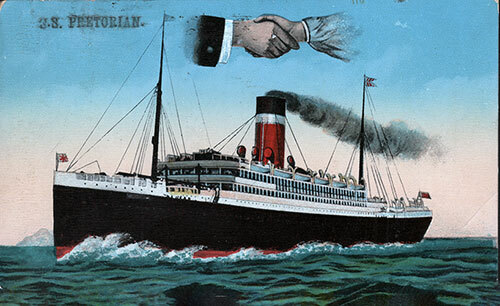 One scarce card, double stamped with two different ship names on the front -- namely the SS Tunisian and SS Pretorian -- as if they couldn't quite decide what ship was represented in this scene. The view of the vessel is near the shoreline, either leaving or entering the harbor. 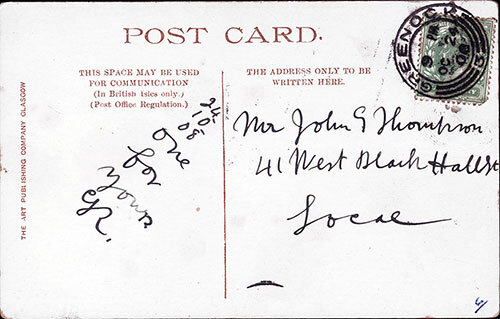 The postcard was postally used on 12 April 1906 in Liverpool, published by The Art Publishing Company Glasgow. The back side appears below. 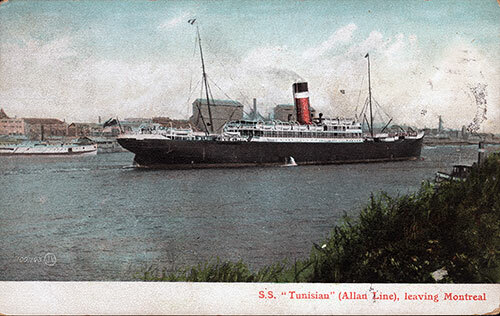 RMS Tunisian. (Twin Screw) 10576 Tons, Length 500 ft., Breadth 59 ft. 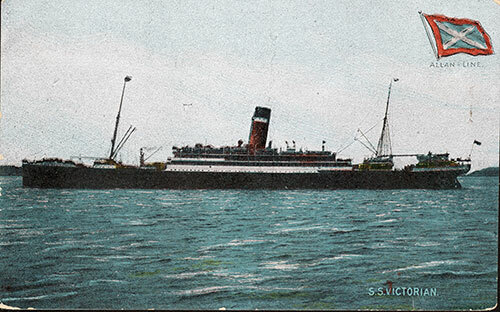 The RMS Tunisian, shown here near the coastline in a painting that the artist wanted to show the reflection of the funnel in the water. Note the reddishness of the water near the center of the image. The ship was a Twin Screw at 10,576 Tons, 500 feet in length, and 59 feet wide (breadth). 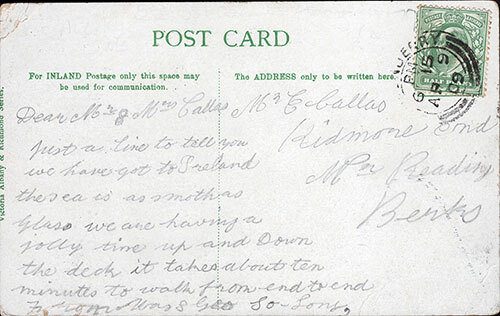 The card was postally used on 9 April 1909 in Londonderry. Northern Ireland. The back side appears below. Postally unused, this postcard of the S.S. Victorian shows the ship near the shoreline. An Allan Line Flag appears on the upper right-hand corner. 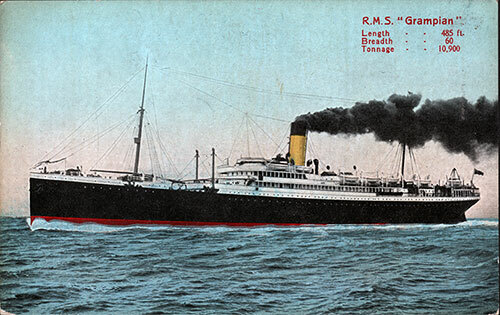 The vessel was in service from 1904 until 1929. 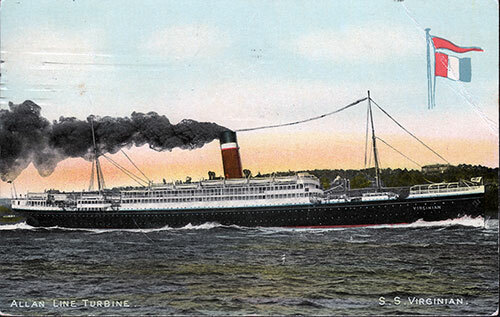 The Victorian was the first three-shaft ship and first turbine driven liner in the Atlantic service. The back side appears below. 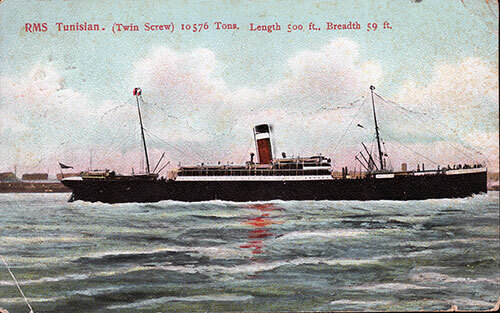 The Allan Line R.M.S. Virginian shown leaving the harbor. 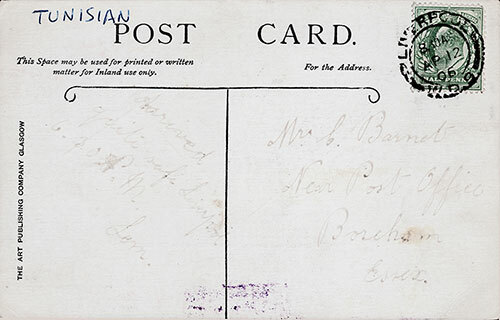 The postcard bears the marking 101,285 J.V. which we believe is the markings of James Valentine of Dundee aka The Valentine Company. 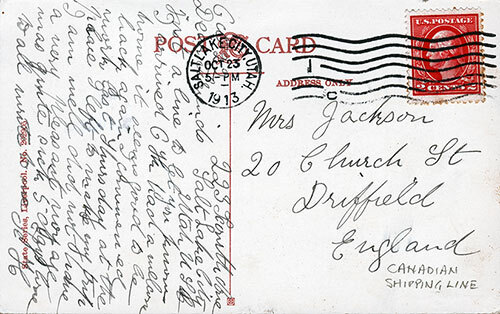 The card was postally used in Milford on 14 December 1911 and featured an upside-down Canadian one-cent postage stamp. The back side appears below. The famous Hands Across the Sea series postcard. It depicts the Virginian cruising the open seas with the ships' moniker clearly visible. 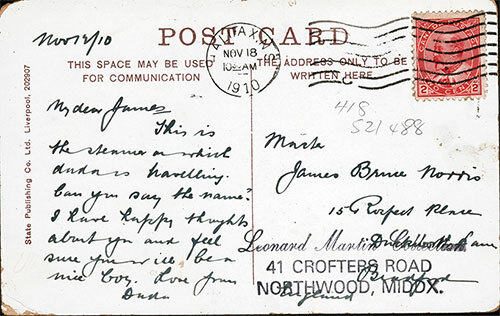 Previously a part of the Leonard Martin Collection, the card was postally used in Halifax, NS on 18 November 1910. The back side appears below. 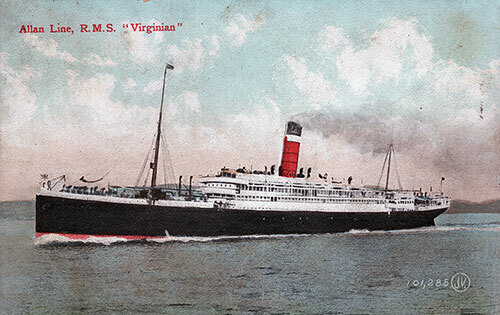 A classic view of the Allan Line Turbine S.S. Virginian showing the Flag in the upper right. If you look closely, you can see the ships' moniker Virginian near the bow of the vessel. 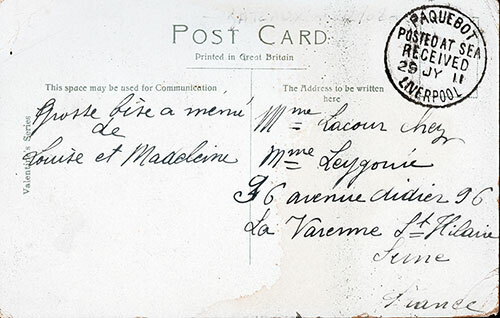 The card was printed by The Art Publishing Company Glasgow and postally used in Liverpool on 29 April 1900 (Something "A"). 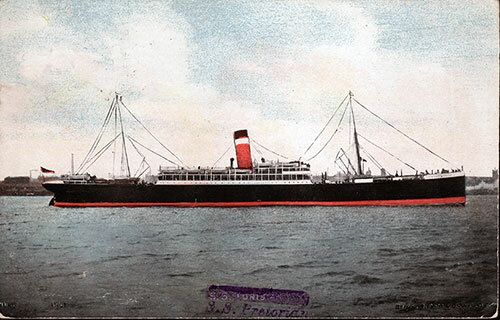 Launched in 1904, she was later sold (in 1920) and renamed the SS Drottningholm of the Swedish American Line, where she was in operation from 1920 to 1948. The back side appears below.